Clinical Quality & Compliance Assessments: We provide investors with an assessment of a potential investment’s culture of compliance, adherence to government rules and billing accuracy and benchmark the company with its peers. Our proprietary process has been honed through a decade of diligence work to ensure our clients receive an accurate, timely assessment of a company’s clinical processes and coding accuracy as well as the risk of financial recoupment in the event of an audit. Our Clinical Quality & Compliance Assessment team is comprised of clinicians, former healthcare operators and coding experts that have deep experience across multiple sectors of healthcare. 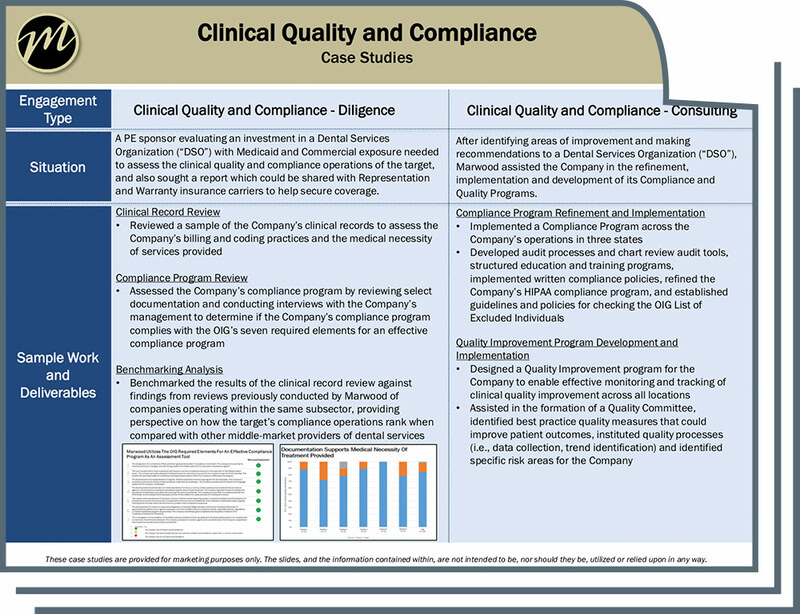 Clinical Quality & Compliance Consulting: We work with healthcare operators to identify areas for improvement in their compliance process and assist them in developing a plan to achieve best practices. Our senior clinical team helps company management develop and implement compliance plans, quality plans, employee policies and procedures, and HIPAA processes and install a process for ongoing monitoring. In addition, our team works with the management of companies under a Corporate Integrity Agreement to ensure compliance with their obligations. Our Clinical Quality & Compliance Consulting team is a group of senior clinicians and former healthcare operators who have worked with many organizations to achieve demonstrable improvement.